Titan Comics has serious form in taking what we know about the Doctor from the TV episodes and then expanding, extrapolating, capturing their voices, their phrasing, the kinds of adventures they have, till their comic book exploits are at least on a par with anything that appears on the show. Often, in fact, Titan can do better than what appears on the show, because one good artist, one good colourist and the imagination of one good writer can bring you universes that an effects company – and often a showrunner – can only dream of. 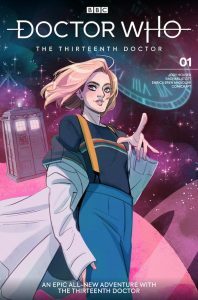 What’s immediately apparent in The Thirteenth Doctor #1 is how quickly writer Jody Houser has cottoned on to the voices of the Doctor and her friends. In particular in issue #1, there’s a good deal of Thirteen reassuring both herself and her fam that she’s seldom wrong about certain things, that odd, slightly vacant pull of indistinct memory of how she’s been before – ‘I’m good at building things – probably’ – is here in force, as is the comedy step-down from certainty (‘Of course we’re safe’) to uncertainty (‘Maybe we’re safe’) to the likelihood that the position is entirely otherwise (‘Probably not’) that has already begun to characterise this bouncy, blustering, sudden-smiling Tigger of a Doctor. The adventure itself begins with two unlikely miscreants robbing an art gallery, to pay their dues to someone who, if he hasn’t got ‘Dark Lord and Proper Wrong ’Un’ on his passport, probably should have. But our Doctor and her friends see things from an entirely different angle – a conundrum not unlike that of the Ghost Monument perplexes them. A hole in space-time keeps oddly popping up here and there and then and now. Cue extreme Doctoral cleverness in tracking the pattern of its appearances, getting ahead of the game and being ready when it appears the next time. Because there’s a hand in it. A hand that keeps trying to reach out through the hole, and a voice that pleads for help. Annnnnd if we know one thing, it’s that this Doctor never refuses a cry for help. Hence all the cleverness that leads the team to pull the hand (and – spoiler – the rest of its owner) into the space-time here and now after a few false starts. Which of course is where things start to get interesting – and equally naturally, where this issue ends. The art of the cliffhanger is alive and well at Titan, clearly, even if on TV, the single-episode story format has rather done away with them so far in Series 11. As with some of her early TV episodes, issue #1 takes the time to breathe and build character dynamics before the mayhem, space-time bouncing and people pointing guns at our heroes really kick in, and again, it’s worth noting how very like the TV versions everyone sounds here – Graham with his wry asides, Ryan with his somewhat breathless dependability and good questions, and Yaz with her enthusiasm to do what’s needed, as well as the Doctor, revelling in seeing the wonders of the universe with fresh eyes. She also takes the time to deliver those almost primary schoolteacher, inclusive, encouraging explanations of what the gang is looking at, so they can fully appreciate it, and she in turn can see it through the filter of their amazement as well as her own. If you’re looking for the fundamental change between the Twelfth Doctor and the Thirteenth, it’s right there in the wonder and amazement and inclusivity of their approaches. There’s little yet of existential angst about the Thirteenth Doctor, she’s all wide eyes and that sudden smile. In issue #1, Jody Houser puts that across to the reader in a handful of pages, condensing all the character-building of several episodes of the TV version into a concise character-portrait and a spot-on tone of voice. But what’s a concise character-portrait and a spot-on tone of voice without the visuals to back it up? Well…it’s probably an audio play, but that’s not the point. The point is that artist Rachael Stott and colourist Enrica Engen Angiolini have you covered. From the shadowy but vivid world of the unlikely art thieves to the jewel-draped Lord of Probably-Darkness, through a whole range of environments, there’s a lushness and an inviting quality to the worlds they render that allows you right in to the drama, and almost gives you an experience beyond the visual. What’s more, the point on which comic-book versions of well-known film or TV properties can sink or swim is allowed to soar here – everyone you know looks like the people you know. Team Tardis are well delivered and coloured, so they match Houser’s skill at dialogue and tone of voice, allowing you to buy completely in to the Doctor Whoness of this adventure. There are a handful of stand-out panels and pages that will make you thankful for eyeballs and evolution – in particular, there’s a glorious page of Tardis console action which actually makes the console look as good as the TV version wants to look, as the Doctor moves from panel to panel, tweaking and fiddling, with a special treat for ye olde style D&D gamers, and a couple of pages of dramatically angled snapshots of a trip through time and space to various locations to find the hole. The Thirteenth Doctor is not perhaps the ‘Boom! Everything’s in danger, let’s run and save the world!’ opener you were expecting, but then if we’ve learned one more thing about the Thirteenth Doctor, it’s that her adventures rarely begin with running and peril – first, they set up the worlds in which the running and peril will shortly arrive. That’s what this issue does – it introduces you to some interesting characters, gives you a central perplexing dilemma, gets its curiosity-hooks under your skin, rewards your eyeballs, gives us a Tardis team eminently recognisable both by eye and ear, and then and only then throws them into mortal danger at the rifle-ends of the Grand Army of the Just.